Clocks247.com, one of the leading e-stores offering clocks for both office and home, lets you choose from a vast collection of various really attractive designs. Add to it the fact that we offer cheap clocks, letting you save anywhere between 20-50%, and you would know why we are a favorite among the customers. Moreover, we believe that our free* shipping policy could also be one of the reasons why our popularity is increasing by the day. •	We have a myriad of options including atomic clocks, wall clocks, grandfather clocks etc. In fact, we have also put up anniversary clocks for sale for that matter. •	We offer numerous brands, including various leading ones, such as Howard Miller, Seiko, and Bulova. •	We bring you extensive variety. Whether you like contemporary clocks or the traditional variants, chances are that here you are going to find something that catches your fancy. What makes us the #1 source for premium clocks? For starters, the moment you read the phrase ‘cheap clocks’, you are like ‘they must be selling low quality clocks’. Don’t know about others, but that’s just not the case with us. In fact, we are a quality-driven clock seller and much to your surprise, we offer a 12-month warranty against manufacturing defects. Furthermore, we have a sound return** policy, which you can easily benefit from, in case the purchase doesn’t work out for any reason. To top it all, when you approach us with your queries and doubts, we get back to you at the earliest, thereby proving that you are of paramount importance to us. •	We keep on adding new clocks on a continuous basis. •	We have a dedicated customer service team to address answers all your queries. •	We give you a clear picture and tell you all about the products that we possibly can. •	We respect your privacy and keep your information safe when you transact online. 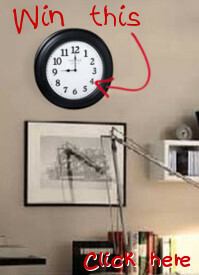 So, look around, ponder over collection, and order one of the clocks that are going to change the look of your living room or ensure that you are always on time when in office. Place your order here online or send your completed order form via fax to 1-920-206-8272. Got questions? Answers are just a call away; dial: 1-855-242-0514. *Shipping is free on all orders over $99. **Floor clocks are not covered under the return policy because of the high freight costs involved.